In addition to Infinite-Smile, we also offer traditional take home teeth whitening at Infinite-Smile. If you are looking to whiten your teeth a few shades, but prefer to do so over a couple of weeks, we have take home teeth whitening kits that will work perfectly for you. Our teeth whitening kits are also perfect for at-home touch-ups needed after receiving Infinite-Smile to maintain a dazzling white smile. 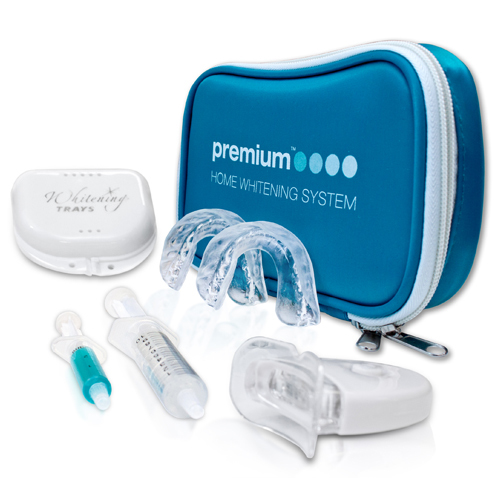 Our take home teeth whitening kits include trays to fit each individual's teeth. The teeth whitening gel is applied to the custom trays and worn for a hour. This allows for consistent and complete contact of the teeth whitening gel with your teeth for the most effective stain removal possible. In about two weeks, you will achieve teeth that are noticeably whiter. Our take home teeth whitening kits can erase years of yellowing and stains from common foods and drinks from your teeth. Enjoy a rejuvenated smile! Contact us to find out more today! Remineralization gel is included to replenish minerals lost during the whitening process and to prevent or eliminate tooth sensitivity in the few people who may develop it. This gel actually strengthens the enamel so is good to use even if teeth are not sensitive. You will not find a better product on the market. All gels are dental grade, made in the USA and are FDA registered.